This past week, I have have seen several patients with neck fusions. All of whom had pain caused by the fusion. For some, the fusion had helped one problem and caused another. For others, the fusion didn’t help and just made things worse. So what’s going on? To understand how a neck fusion works, it’s important to understand the basic structure of the spinal column. In the neck, each spinal segment is made up of a vertebra (a spinal bone), a disc, and another vertebra. This same pattern is followed all the way down the column, from the neck (cervical spine) through lower back (lumbar and sacral spine). Each vertebra meets the next along the back of the spinal column at the facet joints. Every joint in our neck and throughout our spine is built to move. The purpose of a neck fusion, or any level fusion, is to stop movement. The cervical spine (the neck portion of the spine) is made up of seven vertebrae. A surgeon fuses neck vertebrae together by first removing the disc(s) between them and then either inserting bone or a spacer. Hardware is then commonly used to bolt the affected segments together and all of this encourages the bolted vertebrae to grow into a solid mass. With only seven vertebrae in the neck to begin with, you can understand how drastically fusing two or more neck vertebrae together (or in worst-case scenarios, most of or the entire neck—I call these “maxi-fusions”) would affect neck movement. The problem, unfortunately, extends beyond just the immovable fused levels as the forces are now stressed on the segments above or below the neck fusion. This creates too much movement in the adjacent segments and pain after neck fusion, and there is a name for this: adjacent segment disease (ASD). The levels above and below a neck fusion weren’t built to withstand the extra force the fusion causes, and because of this, we see a number of issues occurring with ASD following a neck fusion such as those that follow. Bone Spurs: Bone spurs can form in an attempt to stabilize and protect the adjacent segments from the extra forces. These bone spurs, however, can press on nerves, causing pain in the neck or anywhere along the nerve branch. Facet Joint Arthritis: The small facet joints allow for movement, and just like any other joint in the body, the facet joints in the neck can get arthritis and cause pain after neck fusion as inflammation irritates surrounding nerves. 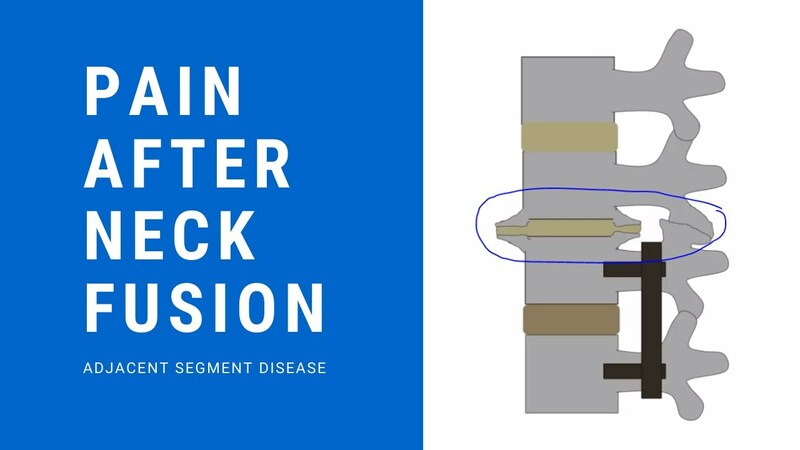 Adjacent segment disease can be an instigator for facet joint arthritis as the joints are experiencing a greater amount of wear and tear due to the additional stress. Disc Degeneration: Discs absorb shock and provide a cushion of support between the vertebrae. In the video above, you can see the excessive load that is placed on the discs in the segments adjacent to the fused levels. These discs weren’t designed to take on the extra load the fusion forces on them, so pain after neck fusion kicks in as the discs begin to degenerate. In addition to adjacent segments, research has shown that a neck fusion can disrupt the normal curves throughout the entire length of the spine, even changing the angle of the tailbone. Another disturbing finding that one high-level study found there was no positive benefit to fusion surgery as outcomes measured at two and five years later showed no improvement. So the neck fusion may solve one problem, but it creates many more! I’ve Already Had a Fusion, Does This Mean I’m Doomed for More? Absolutely not! The solution to repairing the damage caused by one fusion is definitely NOT more fusions. I’ve seen thousands of fusion patients who are now in pain due to ASD, and I’ve seen many patients who doubled down with more fusions before they made their way to me, and it just made things so much worse. In my experience, ASD in most cases can be treated through regenerative solutions (precise injections of your own stem cells or platelets in the structures above or below the fusion) in advanced interventional orthopedics rather than surgery. The upshot? I tell my patients that fusion is a dog with fleas. ASD represents one of the big flea bites. If you haven’t had a fusion, avoid it. If you have, please don’t double down and get more levels fused as that’s like letting it all ride on 22 black in roulette: it might work out, but if it doesn’t, it’s going to sting! I have had neck fusions and plate in my neck 5 yrs ago. Went to the ER due to a fall. The CT scan showed a straightening if the cervical Lord. I was put in a neck brace 3 years ago due to the weight on my neck - the muscles are weak. Can this b fixed and or while in pain management should I b treated for the additional pain? We treat post usion issues regularly. But to see if any particular situation would be a candidate, we'd need more information. To do that, please submit the "Are You a Candidate" here: https://www.regenexx.com/the-regenexx-procedures/back-surgery-alternative/, or let us know for assistance in that process. My cervical spine is fused between c4 through c7. I believe I have had ASD from there moment I awoke from surgery 7 years ago. Have an appointment for testing for neurostimulator. How does your Regenexx work? Is it covered by Medicare?